Swift Playgrounds version 2.2 makes it easier to surface and download free third-party content within the app, Apple says in its release notes. The app, which teaches coding in the Swift programming language via fun, engaging projects, includes "playgrounds" designed by Apple and outside collaborators. In January, Apple enabled subscriptions for third-party playgrounds as part of Swift Playgrounds 2.0, allowing users to stay up to date on the latest offerings from their favorite creators. In addition to third-party content discovery, the latest Playgrounds version includes enhanced touch gestures for selecting code snippets. The gestures are more precise and easier to use, Apple says. A related user interface change displays and hides the onscreen keyboard in a more predictable manner. The What's Next section has also been tuned to provide better suggestions on new playgrounds. Apple includes a variety of unspecified bug fixes and performance enhancements in the latest version of its code teaching software. 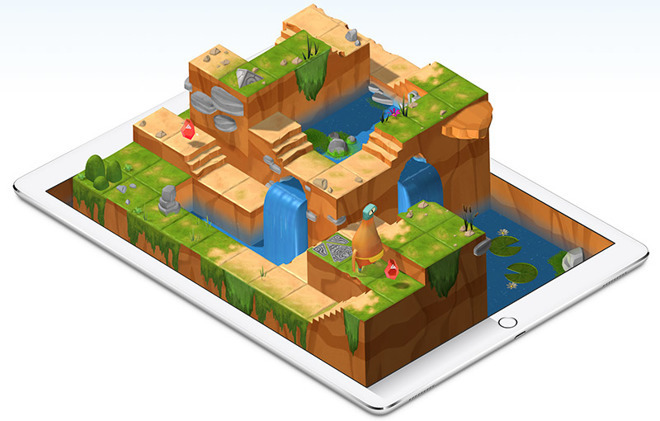 Swift Playgrounds debuted in 2016 as an in-house effort to teach children — and adults — how to code using the company's Swift programming language. The software relies on a 3D world, animations and other interactive tools to teach basic coding techniques to users of all ages, even those who have no prior coding experience. Swift Playgrounds is a free 273.6MB download from the App Store.